I went out today. 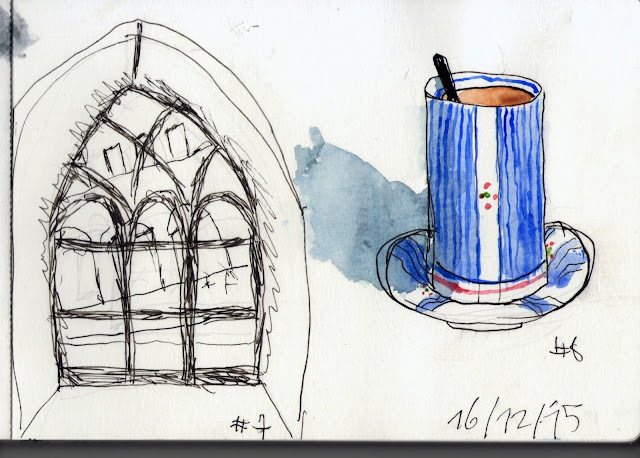 It was a bit rainy so I sketched a gothic window under a bridge. Not much later I got myself a nice cup of tea. This one was made with much less pencil work than the previous sketches. Get good quality paints. But you don't have to get too many colours. Maybe just one yellow, two reds and two blues. Thanks! I'm basing myself on Jane Blundell's Ultimate Mixing Palette.